1.In a small container mix 1 Tbsp of water with 3 drops of food coloring (1 Tbsp of water will be enough for about 5-6 butterflies, double the mix if needed)The more food coloring you add to your water, the more vibrant the colors will be. 2. Flatten out your coffee filter. Using your eye dropper or straw begin to drop colored water onto the coffee filter, one color at a time. Use a separate eye dropper or straw for each color (or the colors will mix and become brown)if you don't have more than one, just rinse it out. As the colors run together they will make new colors! Let your coffee filter dry. 3. Scrunch up your coffee filter in the middle (fold it accordian style if you'd like). Wrap a pipe cleaner around your coffee filter, twist it a couple of times to secure it. 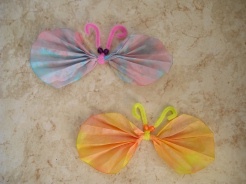 If you have beads, thread them on to each antennae to make the butterflies eyes. Your done, great job!